some of my classmates actually used their pencil cases. but it was good to have a contingency plan. will they bring home that I might have to help them out with? A-line skirt and many of the zippers were sewn by the mothers. I don't remember, but Mum claims she wasn't one of them. Apparently, I was 13 years old and I sewed my own zipper. skirt, you know? It was so uncool. will I be old enough to get my own sewing machine, Mom?" So she sewed her first skirt yesterday. And wore it to school. Am I proud? You betcha. have to get in line to use my own sewing machine. growl, "whaddya mean, you have nothing to wear? getting her own drink of water, or a snack. Am I crazy? Why yes, in some new way every day. get any more basic than that. But it has a waistband. the child can sew even more of it, with less help. bottom hem is already finished, and pretty, besides. personally, so we just used one. 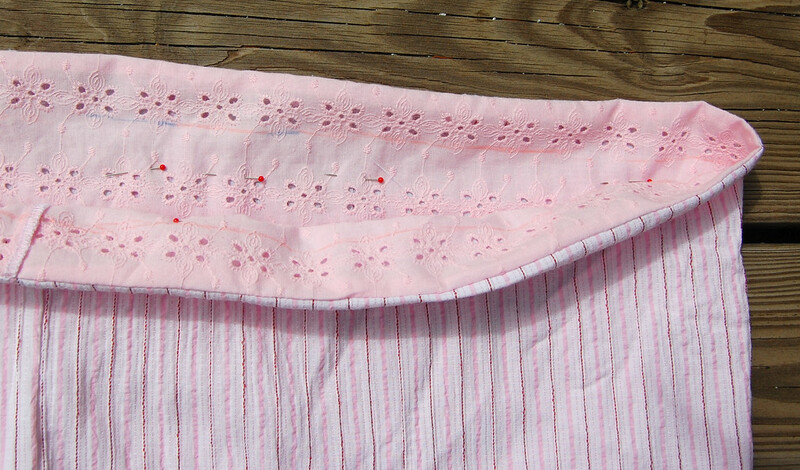 without having to fold a waistband hem. see my ancient skorts tutorial. 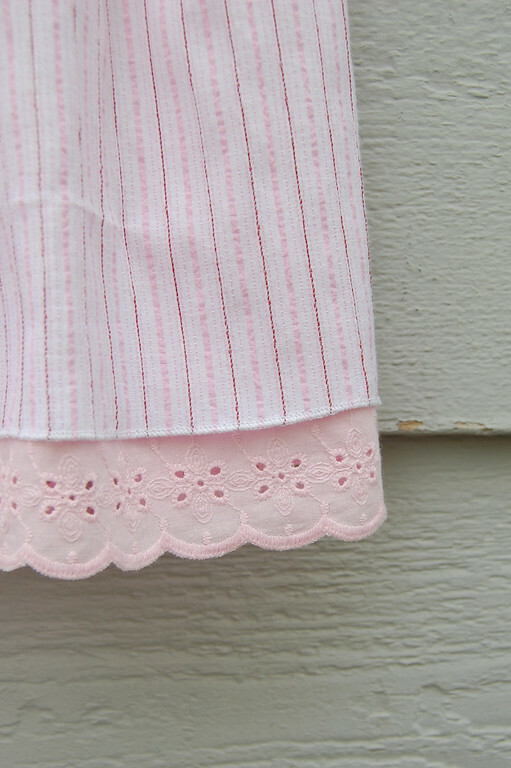 a rolled hem. This means no folded hems and no basting. It took Emily about an hour to make. and one line of stitching to make the elastic casing. shouldn't be about me - this was her skirt. lever and the little thread-cutting knife blade. and I was just enthralled watching her sew. Let them tell me when they're ready to start. Pick something they really want to make, not something simpler that they aren't interested in. Simplify. A tote can be a single rectangle folded down the middle with just two straight side seams. Substitute broad ribbons or nylon webbing for fabric straps and it can be finished in half an hour. They may likely get distracted halfway and need to watch a movie, or eat a snack. Emily stuck at it because she was motivated by her desire to wear it to school that day. I must be prepared to watch them sew crooked seams, draw thick ugly sewing lines all over the fabric, have the print not meet at the seams and not say a word. How wonderful. My son is four and has wondered when he can sew.... not quite yet, but I wonder what an appropriate project for a 5 year old boy would be? My 5year old son sewed a purse, to carry the money safely to the bakery and back - I loved it. He picked two fabrics, I put some felt for stability in between. And then he experimented with my sewing machine: faster, slower, this stitch, that one, that thread and this one - it was wonderful. When he was done, I cut a paper pattern, he put it on the micro-quilt, traced it, I cut (my scissors were to big for his hands and his paperscissors didn`t get through), folded it over to form a purse with flap, fixed it with a wide stich and put bias tape with a little help all around. It was carried around for weeks. "hab ich näht" (I sewed it) he would tell every one and smile. Oh lord, what a smile!!!! That is so cooool! Her skirt is a lot better looking than anything I could do now!!! This is too cute! My 5 year old is super excited to get out her Hello Kitty sewing machine and get to work! Thanks for posting this adorable tutorial. What a gift you're giving your daughters in encouraging their early interests and teaching them how to do it! This is brilliant! I once read an article on an impending skills shortage due to mothers and fathers not handing down the skills they have to their children. Scary stuff really. I was so excited to see that you are teaching your children very useful skills at such a young age. Great job! Hey, I got my first sewing machine for my 8th birthday...and it was a real one, not a kids one. I haven't stopped sewing since! If that's not the cutest skirt!! How awesome you are (as a mommy) for allowing her to 'jump right in' and make herself something. I would have never thought of a skirt as a 'first project.' But why not?? My daughter's first was the same as mine-- a pillow for her bed. I'll have to show her this post and get her inspired. What fun! I remember my Mom teaching me to sew. Two things really stand out. First, she helped me on any step I asked. I started out only sewing straight seams, she did the zippers, sleeves and collars. I did them as I got more comfortable and sewed my first dress start-to-finish at 9. Once I sewed through my finger. Mom bandaged it and made me sit down and sew again right away. It was brilliant because it kept me from getting scared of the machine. I bet she is so proud of her new skirt!! My daughter (6 years old) has also recently begun to sew. One word of advice: don't let the project sit so long that the child outgrows it. That happened to me with a pair of pants!! I had to go back and add ruffles at the bottom. I think Emily's sewing skills may surpass mine by the time she is 6 or 7! That's an impressive first sewing project - way to go! congratulations to your sweet daughter on such a lovely project! Love this! My girls have been begging me to teach them to sew but I keep going back to the ideas of puckered pillows and ugly gym bags that I sewed in Home Ec. 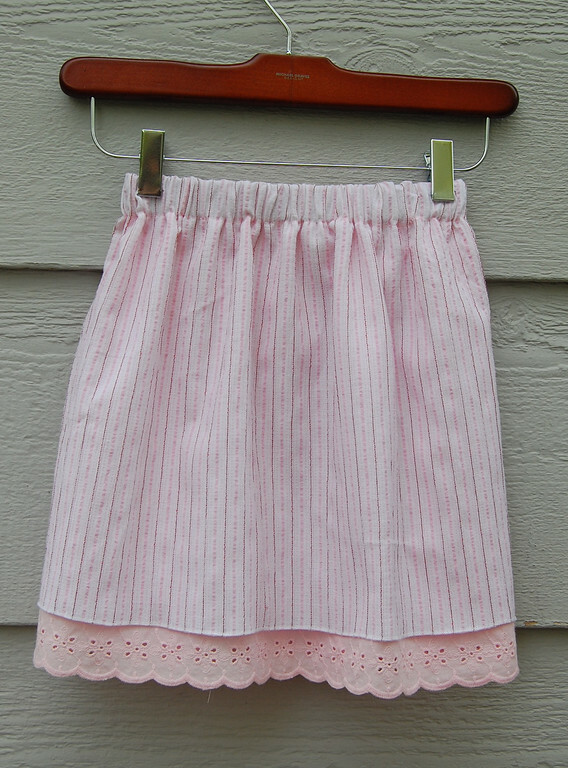 The skirt is a perfect beginner project. Thank you so much for sharing. I'm now a bit more encouraged that it's something my girls can actually do. Thank you for this! My 6-year-old daughter has been begging for sewing lessons. She made a doll once, but it was too hard and I ended up finishing it. This is PERFECT. Awesome! My dd is 6 and wants to learn to sew, knit and crochet. I did manage to teach her finger crochet for now. I think we will try this dress. Yeah to Emily!!!! Beautiful skirt. I have a 6 yr. old seamstress also. Boy is it fun! She did a wonderful job. Good for you for being such an inspiration to your daughters! I understand- My 5 y/o helped sew her scooby-doo camouflage shorts.. hems and all. Good job! Love, Love, Love! I hope in a couple of years my little girl is excited about making something herself. She loves to come in my studio and pretend to sew and has even tried to use my little hand crank sewing machine. Well! I'll be.... if your 5 year old can sew like that, I'll bet that it is possible for me and I am a grown up adult! That is great! My 5 year old is starting to wear me down. 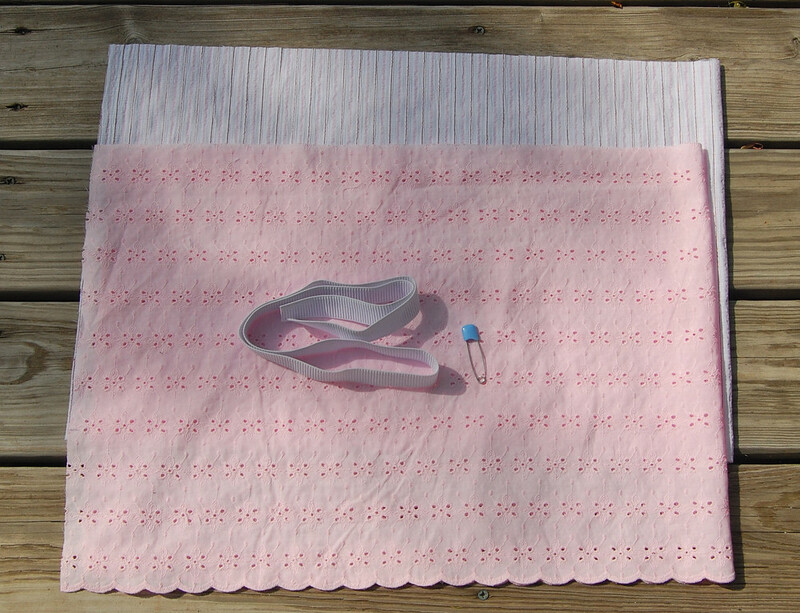 I have let her sew straight lines down the center of fabric scraps and follow lines on paper. She is pretty good. Maybe it is time to move on to a skirt. My problem is I. Me. I. want to sew on the sewing machine. Patience. How wonderful to see her enjoying it and doing such a nice job, too. 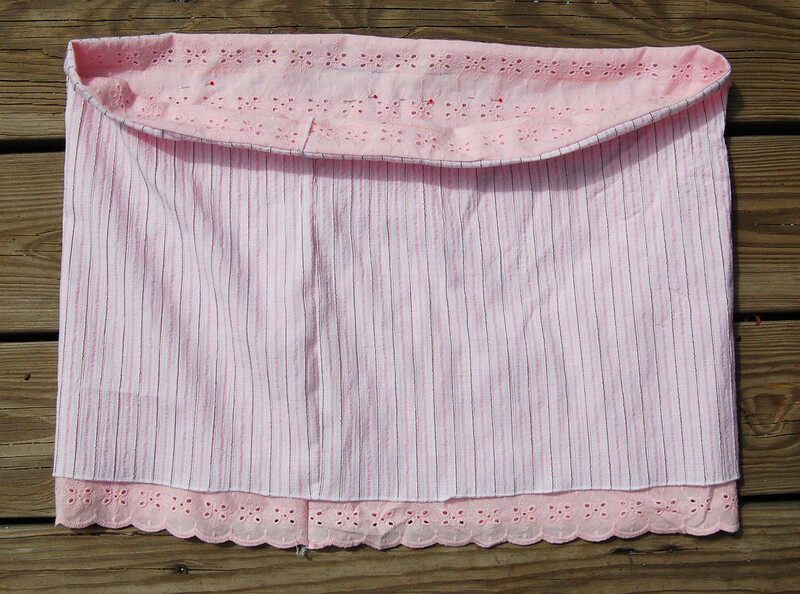 I remember my mom showed me how to use her sewing machine was I was 5, but mostly I handstitched (wretched) things. so smart! I like having my girl around me, but that does mean she wants to do what I'm doing too! I appreciate your advice and insights. I would not have realized the value of a 2-layer skirt as a simple project. Her skirt looks amazing! I made a little felt bear (by hand) when I was four or five, and I would have loved to try a sewing machine. Mike actually made a little doll on his grandma's sewing machine when he was two years old! Great job! It's wonderful that you're passing on this skill to your girls. FYI, in S'pore sewing is no longer taught in Homec. The focus now is on Food & Nutrition. Sad , isn't it ? My mother made the mistake of threading a needle for me at the age of 3! All my primary years I made clothes for my dolls that I received every Christmas and sometimes during the year. I saved my "milk money" and cleaned my father's records until I was 12 and purchased my own REAL sewing machine. (My mother paid the tax on the machine-SHE got the better part of the deal on that one!) I made an apron-drew each piece of it on paper first and then a blouse from a commercial pattern in 7th grade. I didn't have home ec again until high school. I made a shirtwaist dress and a simple jacket/A line skirt. I taught both my daughters to sew at 3 and my grandaughter. My eldest daughter taught my other grandaughter to sew because she lives in Alaska! 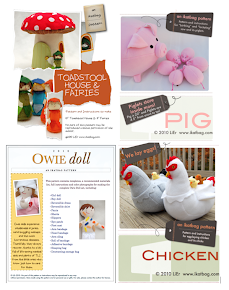 I'm now teaching how to sew a cloth doll to total strangers as of June this year. It's FUN to pass on skills since there is no Home Ec classes anymore. Oh yeah. I did pull that line about "make it yourself", but my daughters never really said they "had nothing to wear" because they HAD made clothes for themselves! I'm a grandmother/epreneur and what you have done online is TERRIFIC!!! I have 2 customers who want matching doll clothes/girl clothes sizes 2-14. Where can I find a measurement chart that shows all 20 some odd measurements so that I can draft designs myself. Even a chart that shows one size and a tutorial on how the grade that size would be EXTREMELY helpful. It's March 23rd 2011. Could you send an answer ASAP? I can't find a chart for the measurements except for a fraction of the 20 some odd measurements. I would rather NOT use commercial patterns because I want the drafting to be totally done by me! Love it! Thank you for sharing. My boys are fascinated with my sewing machine, might have to let them give it a whirl! I am thirteen and have recently finished an a-line dress in my textiles class at High School. I love this project and the accompanying story! I have been looking for a beginner project for my 6 year old granddaughter and I think this is it! 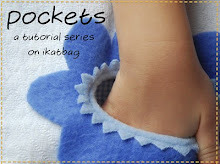 How fun to make something you can wear as apposed to a doll blanket or some other lame project! I read this post a bit late, but I was surprised to see that someone else in the world once had my same pencil box (plastic-vinyl Little Twin Stars double-sided pencil box with 1 million different compartments)!!! Exactely I mean the pink rectangular one with magnetic closures on both sides!! I'm a mummy too, and happy to see that also now the sewing machine is our kids' favourite game! If you are interested in a sewing machine for children, I can recommend the Janome Sew Mini. It is a real sewing machine, not a toy, but it is perfect for beginners. I even use it for small projects sometimes. Watch for a coupon and you should be able to get it for under $50. The only negative is no light, but I've added a clip on light. Thank you for the recommendation! Am always happy to hear about what other folks use with their kids. The day will come when I will have to think of a machine for Emily, and I'll be so glad for your input! Thank you! About to start teaching kids how to sew and will be buying machines. Will look for the one you recommended. My own kids are 5YO and 8YO, I also teach sewing to 3rd to 8th graders, and I have to say that for a 5YO to be able to sew this, they have extroidinary fine motor skills and a greater attention span than any 5YO I've every known. IMHO the majority of kids don't have this level of development until they are until they are somewhere between 7 to 8! I just found this and love! Only thing is a serger doesn't do rolled hems and zooming in on the hem it looks like a mock merrow edge stitch which is something I do as well. The rolled hem takes a special presser foot and is done on a single needle machine. So, my 4 year old granddaughter told me she was getting a sewing machine for Christmas. I quickly texted Santa and asked why she hadn't told me! Santa replied, "Because it's the first I've heard of it." So, Mema got her first sewing machine and the week after Christmas she and her brother (age 7) came for a few days. He complained that he wanted to sew too, so I got out my small machine I take to classes. They both have made a quilt. Hers is doll sized and we finished it this weekend. His is larger, he added a border and sandwiched it this weekend. He'll quilt it next time we are together. So, now Ruby wants her next project to be clothes. I think we'll start with this skirt! Thank you! We did it! She did most of the sewing, I helped with the cutting and put in the elastic. She's so proud! Adorable skirt. How did you know how much fabric you needed to make the skirt? Did you measure around her hips and then increase it? I know curtains are 1.5X-2X. But a skirt? Thanks. LindaT: There is no fixed rule for skirts (and there aren't for curtains, either) - just rules of thumb and personal preferences. I've heard the 1.5X- 2X "guideline" for curtains, too - but it's really just what looks sufficiently gathered/pleated/ when they are fully drawn. 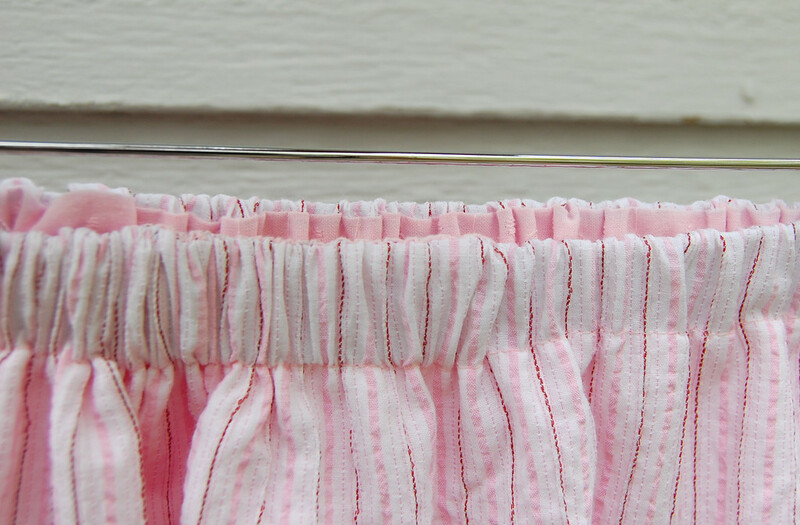 The same goes for gathered skirts - 1X will give you a pencil or Aline skirt, and anything above 1X will produce some amount of gathers and - subsequently - flare at the hem. Also, the weight and bulk of the fabric will determine what factor to use - something drapey like a knit would look good with a higher factor (e.g. 2-3X) and something like corduroy or fleece would be better off with a lower factor (e.g. I dunno - 1.5X). It really is up to you. I'd suggest estimating what circumference you want for the HEM, and then cut a rectangle to that width, and gather at the waist to fit. Don't worry about the hips. Thank you. I am teaching a neighbor child how to sew and thought this would be a good project for her. Love your site! How much material to use for a "5" year old for skirt? Thank you! Patty: I can't remember how much I used -this was years ago - but see my reply to comment #47 above for how to estimate yardage for a gathered skirt. Great starter project and good tips too. I bought my grand-daughter a sewing machine for Christmas and I have to be prepared because I KNOW she will want to make something right away!